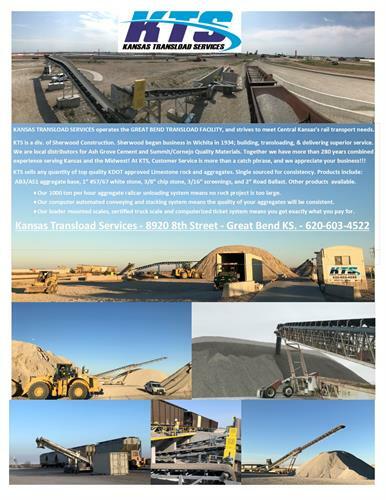 Kansas Transload Services- Rock and Aggregates- KTS, A division of Sherwood Construction. 8:AM to 5:00 PM, Monday through Friday. Kansas Transload Services, aka KTS, is part of Sherwood Construction Company. Sherwood started business in Wichita in 1934, and founded KTS in 2016 to operate the Great Bend Transload Facility. Sherwood is known locally for building the Flood Control Levee project that keeps Great Bend safe from catastrophic flooding like the 1942 and 1981 flooding! At the core of the transload operation is our 1000 ton per hour rock and aggregate railcar unloading and conveying system. Stockpiling with our computer operated 150 foot radial stacker allows us to maintain the highest consistency in our materials. 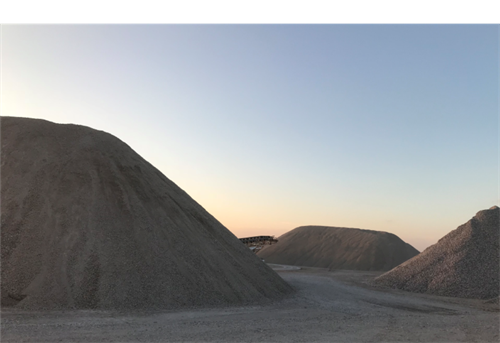 Our KDOT approved Ervine Creek (Elk County Kansas)high calcium limestone materials come from Summit/Cornejo Quality Materials’ Moline KS Durbin quarry. This quarry is known as some of the best rock in the region. 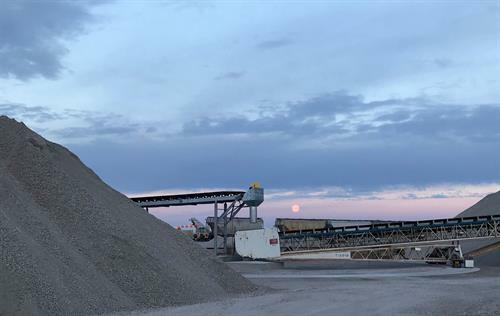 Our stock products include 1” washed “concrete” stone (meets both #57 and #67 specs), AB-3 base aggregate (also meets AS-1 specs), 3/8” asphalt stone (ASTM #8 spec), 2” RR and road ballast, and 3/16” limestone screenings; but we have a wide range of products and materials available by special order. We have loader mounted scales and a 77 foot truck scale to get you what you need! We partnered with Ash Grove Cement (a CRH Company) to transload their dry bulk cement materials directly from railcar to truck. Our 3 railroad tracks within our 18 acre fenced location to use for a variety of rail transportation and transloading projects. From t-posts to pipe to powerpoles, from bentonite to bonemeal to flyash,containers to chemicals... even wind turbine components! How can we help? A Sherwood Company. Division of Sherwood Construction. Wildcat Construction, A KTS Sister company. Borton Construction, A KTS Sister company. Located West of Great Bend. Between Highway 56 and Barton County Road (10th Street ) West on 8th Street off of Airport Road.